Caedmon, the student band I was in thirty years ago, got back together. 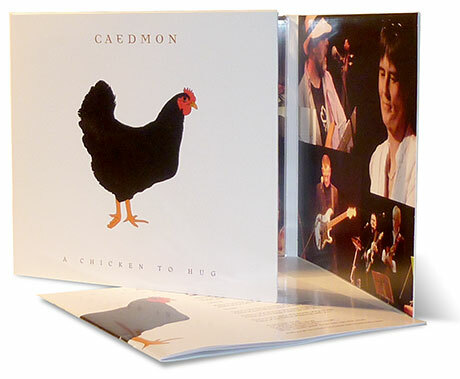 We wrote and recorded that difficult second album over the last 12 months, called it ‘Chicken to Hug’ and released it just before Christmas. So far, the album has been very well received, with positive reviews. I personally recommend that you buy several copies, to help me get rid of the big box of CDs currently sitting in my little studio. However, if you're reluctant to part with whatever ridiculous price Amazon are charging for the limited collectors edition, you can still buy the album on iTunes at iTunes prices. Just remember that our last (vinyl) album cost £2.50 in 1978 and now commands more than £500 sterling in good condition. Yes, you just saw me promoting my music as an investment opportunity. Yebbut, what does it sound like? So, you're probably wondering what it sounds like. OK - check out this youtube clip.